As we get older, less oxygen is supplied to the skin and the skin cells’ metabolism will slow down. This causes dull skin, wrinkles and slackening of the skin. With Oxyderma oxygen therapy, we can tackle this problem effectively. We can achieve better circulation and activate the production of collagen and elastin to give you a firmer skin. First the skin is cleansed thoroughly. Dead skin cells are removed using a peeling. 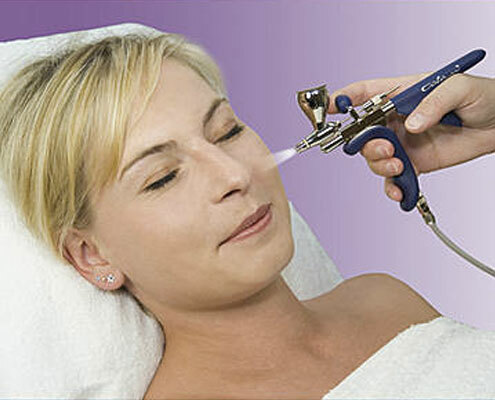 At Beauty Clinic Lotus we use the Oxyderma – a device that produces about 95% concentrated oxygen. Using an airbrush a serum of your choice is applied. Anti-ageing: Prevents the formation of wrinkles and reducing existing wrinkles. A very effective combination of components which significantly improve skin smoothness, reduce the number of wrinkles and moisturise the skin. It also reduces skin irritations. The component hyaluronic acid, which also occurs naturally in the body, ensures a visible reduction of wrinkles by moisturising the skin. Regeneration: For a radiant complexion and a smoother, more elastic skin. The natural marigold extract prevent infections of the upper skin layers and improves the healing of small wounds. A natural anti-ageing component protects against the ageing of the skin by sunlight. Allontoin and D-panthenol care for the skin and moisturise it to the right degree. Whitening: Against pigmentation and age spots. These drops contain two active ingredients both of which correct excessive pigmentation of the skin by fading age spots. Because of the mild natural ingredients, the skin is not as sensitive to the sun as with other bleaching methods. After this the beauty therapist will “airbrush” oxygen over the skin 2 or 3 times. This oxygen treatments ensures that serum penetrates more deeply into the skin. Under pressure the ingredients disintegrate into smaller molecules which are “squeezed” into the the skin, as it were. Oxygen treatment gives a better results than when serums and creams are applied in the usual way. The treatment feels very pleasant and relaxing. A treatments lasts about 40 minutes. The best result is obtained by doing a course of 6 treatments. After one treatment you will already feel a remarkable difference. To maintain the result, we recommend repeating the treatment once every 4 to 6 weeks. The oxygen treatment can also be given in combination with microdermabrasion. This treatment is a lot more intensive and lasts about 60 minutes.